Well we are officially 3 weeks in to the Great Potato Harvest, and the Yukon Golds are about done. They are sizing up nicely -with a few rare lunkers coming in at almost a full pound –each. With today’s take of 170 lbs we are officially at 575lbs in, and my best guess is about 5-600#’s of Carolas left, on top of the last 150#’s of Yukons. Add in a hundred combined of Green Mountain and Buttes and I just might break 1500#’s yet. The pic is from the first batch of baby Carolas 2 weeks ago they are continuing to add weight -I am getting about 25% more poundage per Carola hill than the average Yukon hill. On top of that the Carolas are living up to their billing as the “Brandeywine” of potatoes. Super moist and tender, they all but melt in your mouth after roasting, frying in a skillet, or soaking in a wet curry. 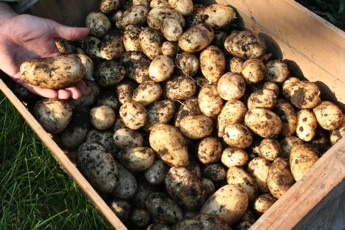 The Yukons are much firmer and have been perfect for our potato salads. 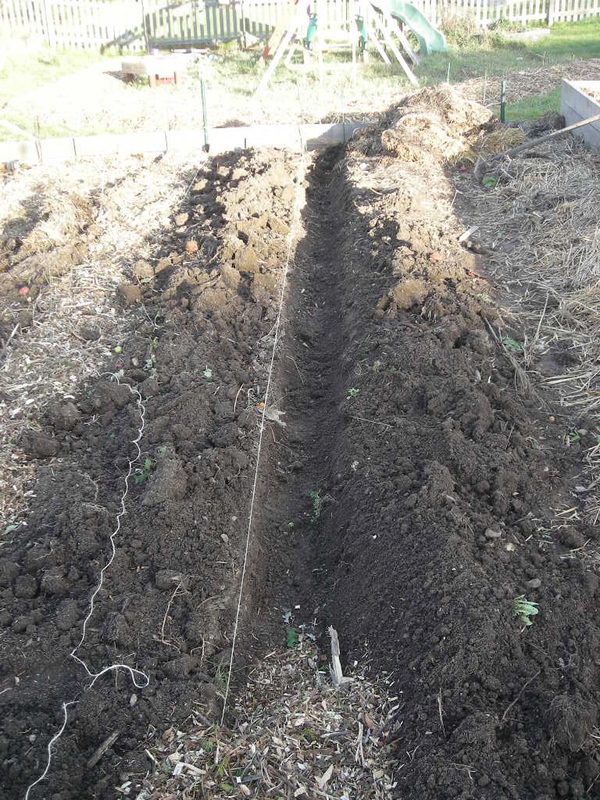 It took 3 weeks, but we are slackening our passion for potatoes -we had gone almost 2 weeks with them at 2 of 3 meals per day. Still, they are carrying a meal a day most days. And that is why I like spuds -they are what I call a “calorie crop”. It is difficult to just eat Peppers, Cucumbers, or Tomatoes etc as a main course -even for vegetarians. But Corn, Potatoes, Squash etc can anchor a meal. It is also said that Potatoes pack more energy per acre than any other crop. My 4500 sq ft (1/10th acre) will net 625,000 calories if my figures are right (26 calories per ounce for 1500 lbs). That is ALOT of calories!! Considering this is harvesting at baby weight, and/or using low yielding varieties like Yukon I don’t feel bad about being significantly off the typical yields of 30,000 lbs per acre conventional. A field of Purple Viking left to maturity would come very close to that. So next time That Guy at work says we can’t feed the world organically, shove the figure of 6.3 million calories per acre at them and be comfortable that there is still 4 million calories of production on the table! !